"I expected good, but this is great." -Janet Pirus Phelps, Principle, Strategic CFO, Former CFO Papa Murphy's Pizza Gaps . . . holes in your organization where tasks fall and failure breeds. They inhibit your ability to implement strategic plans, lead people, and run successful projects. Daily, executives, middle managers, and project managers wrestle with "the big six": Absence of common understanding Disengaged executive sponsors Misalignment with goals Poor change management Ineffective governance Lackluster leadership Ignoring any of these gaps will hex any strategy or project. They regularly destroy hundreds of companies' ability to turn their corporate vision into business value-taking careers with them. 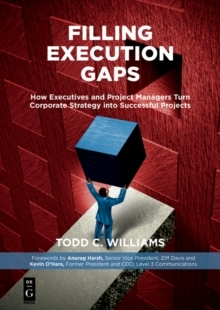 Filling Execution Gaps addresses the sources of these gaps, and how to fill them. Without any one of these important functions, projects fail. Without change management, adoption suffers. Without common understanding, there is confusion. Without goals, business units, and capabilities aligned, execution falters. Without executive sponsorship, decisions languish. Too little governance allows bad things to happen, while too much governance creates overburdening bureaucracy.